If you’re interested, the white version is available to order again on Amazon, and good news: code ANKER436 still drops the price to $11.24! I would hurry, though. Thanks dude only seeing white though. Thanks, I've been checking it daily and personally I'm waiting for black to come in stock. I've noticed availability on the white model getting pushed out further and further. One day it said August 2nd to be in stock and now when I check it says August 8th. I'm waiting for black in 3ft and 6ft if they ever made it. For anyone that was able to purchase this cable, were you able to achieve 3 amps output from the usb c adapter? I came across a youtube review of this cable and the user measured the max output via usb c and he barely pulled half an amp. Yet the amazon advertising states 3 amps via usb c.
I check in on these cables daily and nothing has changed @AnkerOfficial can you shed some light on the matter? Like the YouTube video creator, I also notified Anker of the same issue. This cable cannot give 3A in a typical USB-A to USB-C connection due to the 56k pull-up resistor. The resistor is literally designed to limit power output in a type-A connection. That's why he has no issues when using a type-C to type-C connector. 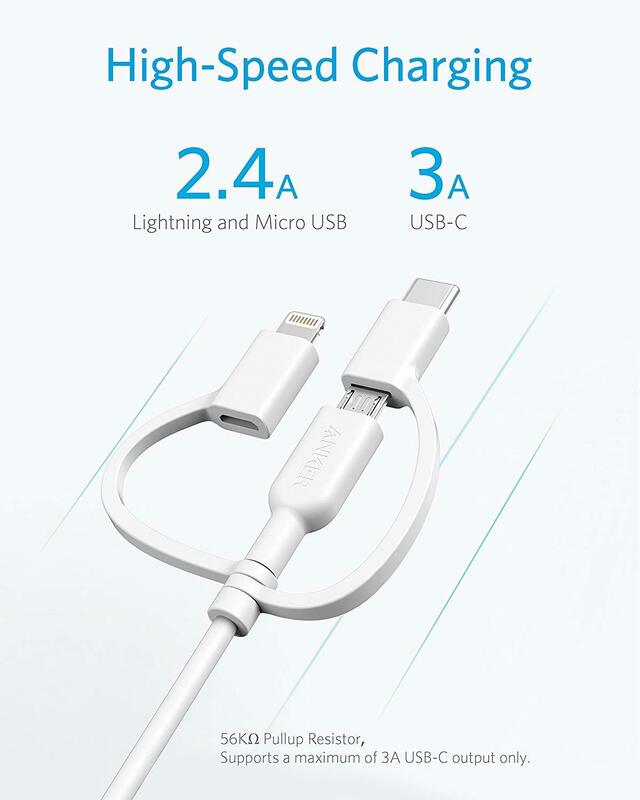 Anker maybe implemented a proprietary logic (like PowerIQ 2.0) that overrides this, but they haven't been able to explain under what scenarios this cable can offer 3A in my latest email back-and-forth. I think the marketing department needs to have a longer discussion with the engineering department. I did note they updated the Amazon description to confirm the presence of the 56k pull-up resistor...but they still somehow still claim 3A. Not really sure what you are talking about . It doesn’t advertise 3 amps. Can’t pull that much through usb A. Answer to your question is pictured here. UPDATE: Anker’s PowerLine II 3-in-1 cable is available to order again and should begin shipping on August 23 in black and August 25 in white. Ok now I'm confused. If the premium double-braided nylon cable has a lifetime warranty, what's the difference between that and a powerline 2+ cable? Also how does that cable compare in thickness to the powerline 1+ cable? PowerLine+ II is more durable at 30000 bends vs 5000. Also how does that cable compare in thickness to the powerline 1+ cable? I believe PowerLine+ II is slightly thicker than PowerLine+. I just finished a month off-grid living reliant on a few Anker products including cables. I was human powered so all weight and all volume of Anker products were being lugged by my body. I had one cable fail, but to be honest, two thinner cheaper cables is less weight than one thicker cable. I fear Anker is over-engineering cables given that the common failure points are the bend at the cable ends as they enter the ends. The focus on cable strength is nonsense, I'd rather a high force on the cable to make the plugs pull out easily to remove the stress on the devices, and the cable withstand the usual wear at the ends, than focus on the cable between the ends. I’m glad to know you comeback! I am new to Anker products and am looking for a charger to use with the Anker PowerCore II Slim 10000 Ultra Slim Power Bank. I mainly use lightning USB for my phone and micro USB for my headphones both in short 1 foot length. Is there any advantage of using this longer 3 foot 3-in-1 cable over two short individual ones? Would the lightning output power reduced by using the connector? This is mainly to help simplify people's cable needs. For those who have multiple devices and only want to carry just 1 cable, that's who this is for. Do you guys think this cable will be released in 1 feet? It would be really helpful for my purse when traveling. So it's almost a year later and I'm still waiting on a 6 foot version for my car. Since that's never going to happen it seems, any chance @AnkerOfficial could sell the adapter tips WITH the rubber connecting cords separately? or would it be possible for anker to sell and for me to use a 3 foot usb-A male to Usb-A female extension cord, or would that reduce the amount of power available below 3 amps?